Last week I described how to build an ATSAMD21-based computer on a prototyping board using a 32-pin ATSAMD21E with the minimum number of components, and program it from the Arduino IDE. Minimal computer on a breadboard, based on an ATSAMD21G. As before, you first need to upload a bootloader to the bare ATSAMD21 chip, using the Arduino IDE and an Arduino Zero as a programmer. You can then program the minimal ATSAMD21 computer from the Arduino IDE via the USB port, like any other Arduino board. Like the ATSAMD21E, the ATSAMD21G is an ARM Cortex M0+ processor with up to 256KB flash memory, 32KB RAM, and a 48MHz clock. 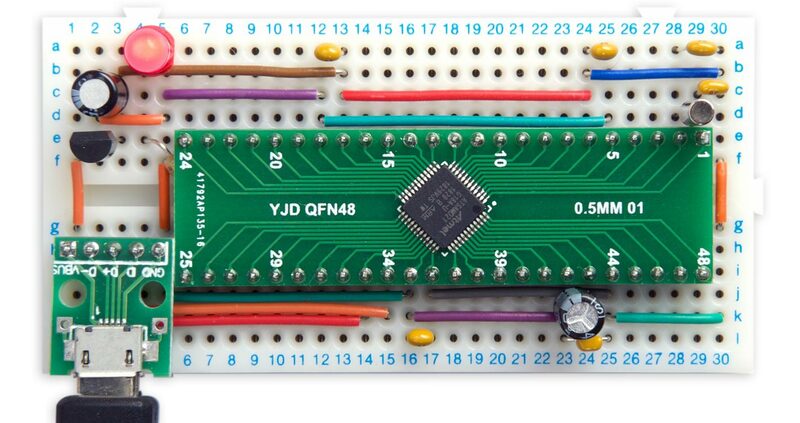 However, this has 48 pins rather than the 32 pins of the smaller chip, which gives you 38 I/O pins rather than 26 in the smaller chip, and 14 rather than 10 ADC channels. I recommend getting the variant with the maximum 256KB flash memory and 32KB RAM, the ATSAMD21G18A. Circuit of the minimal computer based on an ATSAMD21G. I mounted the ATSAMD21G on a 48-pin breakout board from AliExpress . As in the ATSAMD21E version it was easier to connect the two crystal capacitors to Vcc on the prototyping board; it makes no difference. The 330Ω resistor is tucked under the breakout board as there's nowhere else to fit it. The other components are the same as the ATSAMD21E version. As before, when you first connect power to the circuit I recommend monitoring the current consumption, as this will quickly give you an indication of whether there are any shorts or incorrect connections. The expected current consumption at 3.3V is about 12mA. If you're getting much more than this, quickly disconnect the supply and check your wiring. If you're only getting around 0.3mA your crystal may not be oscillating; check the connections to the crystal and the crystal capacitors. Here's a variant of the classic Aduino Blink program that blinks out the series of prime numbers, starting with 2, 3, 5, 7, 11, etc, up to the largest integer that uLisp can represent, 32767. You could also use this to demonstrate the existence of intelligent life to visiting aliens. To exit from the program enter ~ and press Return. ^ QFN adapter plate 48p on AliExpress.